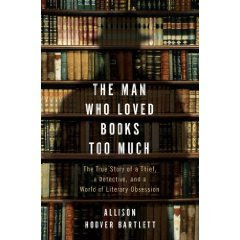 Today on Keri Miller's Midmorning show on MPR she hosted Allison Hoover Bartlett--author of "The Man Who Loved Books Too Much"
My impression, after reading the book, was that she intended to write a book on book thieves in general. However, she became so fascinated by one man, John Gilkey that it turns into his story. Like all career criminals there is no simple explanation for his obsession with books. Very rarely does the subject of a book agree to discuss his crimes and give details of the how's and why's. Find today's interview at mpr.org and then read the book, or vice versa. Fascinating stuff. In less illegal terms, I have fallen head over heels for a new book and think it is the title I will champion from now through the holidays. I generally try to find a book from a small press or a book that will receive little to no press attention to push. I'm breaking my rules a little bit. In 2005, Graeme Gibson had a book entitled, "The Bedside Book of Birds" and I remember we sold a lot of copies despite a price($37.50) that I found quite odd and a little high. So today when I saw his new book I immediately glanced at the price($35) and found myself pleasantly surprised. Then I got lost in it for about fifteen minutes--which is something I very rarely do. "The Bedside Book of Beasts" is a compendium of, yes, beasts. There are lots of collections out now that seem mish-mashed(is that a word?) together and lack cohesion or any sustained theme. This book makes sense and has quotes and art from around the globe. The color and quality of the images is really what makes the book in my mind. Mythology, cultural history, biology, poetry, religious thought all weave into the narrative. This is the kind of book you buy to give away and end up keeping for yourself. My words do not do it justice--stop in and have a look.